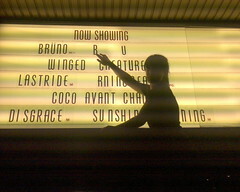 Saw Brüno last night at the Dendy on Newtown. And yes it does make you cringe. There are some good bits, and some bits where you just wonder ‘why am I watching this’. I can see why people have said the film is really bad, but I think is intended to be. The SMH review was interesting to note that Sacha Baron Cohen has become that which he once mocked. And I wonder how he continues to be able to get away with his interviews. The thing I’m most annoyed about is that I sat through all the credits, and there was nothing else to see on the end. This entry was posted in Movies, Photos and tagged Brüno, movie, Newtown, photo. Bookmark the permalink.